Rocket Accelerator is a liquid additive which is used in small quantities with urethane hardeners to achieve rapid through curing. It may be used with normal or medium solids (MS) or high solid (HS) systems for air drying or stoving. 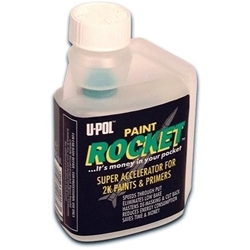 - Rocket Accelerator speedens the through curing of urethane primers, color and clear coats, significantly reducing baking times - offering increased throughput and energy-saving in the workshop. - Increase ouput & profits!